Do You tolerate poor health and unhappiness? I believe you don't need to. 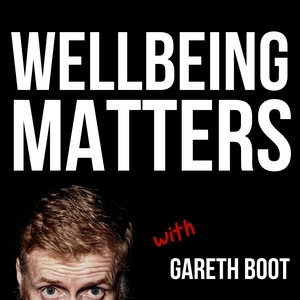 My name is Gareth Boot and on this podcast I will be sharing thoughts and ideas on ways to improve your wellbeing and talking to interesting people about what they do to live happier, healthier lives. #030 "Review of last weeks walk with Sue"
In this episode we review our walk last week and how we found it. Also listen to the end when I announce something about the podcast. In this episode I talk with Sue about our walk tomorrow. #028 "Spring has Sprung, use it." We have a new season to enjoy and in this episode I talk about the seasons, both in nature and life. #027 "Talking to my daughter about wellbeing and stuff"
In this episode I have a special guest in my 14 year old daughter Emily. We talk about her dancing and her recent first attempt at walking the great outdoors. He first time being recorded, and I think she did great. #026 "Sue talks legs workout"
In this episode I am again joined by Sue as we talk about our recent experience doing a less workout together. #026 A New Style "documenting not creating"
I want to make the podcasts more of a documenting style going forward as I enjoy these kind of episodes. Listen to this short episode to find out more. #024 "Small change of direction"
Changes the name of the podcast to reflect a small change of direction with my work. This episode will explain it all. Are you now or do you ever feel stuck? we all do. In this episode I share how to get out of "Stuckness" and into how again. #022 "Talking Travel with Sue"
A bit of a chit-chat with Sue about travel and how it can expand our thinking and understanding. Have you ever quit something because your expectation didn't match the reality? I know I have. In this episode, I talk about how we can avoid this. #020 "Do what you love?" In this episode, I talk about doing what you love and share a book I have recently read that inspired me to as myself what I love doing. #019 "No Place To Hide"
I have changes the name of the podcast and in this episode I explain why and how we have to step up at times to move forward. In this episode, I talk about how to deal with frustration and I share something that I allowed to frustrate me this week, the effect it had on my productivity and how I overcame it. In this episode I talk about how positive affirmations and thinking positive are not a good strategy for moving forward and how changing beliefs is the key. #016 "Keeping your environment clean and tidy"
In this episode I am joined by my partner Sue and we talk about the importance o keeping your environment clean and tidy and how that can affect our mood and wellness. #015 "Sensibility and Flexibility, why they are important." The ability to be sensible and flexible are essential when taking on challenges and goals. In the episode I share how I had to use sensibility and flexibility recently and why you should consider it when things don't go to plan. #014 "A week away from social media"
On the 18th January I decided to take a break from using social media, in this episode i share my experience of that break. #013 "Listen to my Harp Beat, interview with Rhian Evans"
In this episode I talk to professional harpist Rhian Evans about her journey to becoming a musician and her recent changes in lifestyle that allowed her to quit drinking and smoking. Developing resilience is so important if we want to live a life where we can go after the things we want to overcome or achieve. In this episode, I talk about resilience and give you an example of how it shows up in my life. In this episode I talk about simplicity and how asking a couple of questions can help you become more effective and avoid overwhelm. #010 "Skateboarding and Photos, an Interview with John Steel"
In this episode, I talk to John Steel, a professional photographer, ex-skateboarder and all round nice guy about his life and career and how he followed his passion for doing what he loves. #009 "The tortoise and the hare approach to goals"
In this episode I talk about the power of consistency in taking on goals and challenges. In this episode, I share some feelings and thoughts I had around a recent posts on my Facebook business page and what it taught me. #007 "Why New Years Resolutions Fail, and how to avoid it"
My first podcast of 2019 so I wanted to talk about and share the 3 reasons new years resolutions fail an how to avoid them. If you are listening to this at another time of the year, the advice in it works with any goal or resolution you take on. #006 "Don't take massive action"
In this episode, I share my thoughts on setting achievable goals and actions and why I believe some of the advice about taking massive action and having huge goals is a bad strategy. #005 "Don't feel ready to start? do it anyway!" Do you ever put off starting something because it doesn't feel right ot you don't feel ready? In this episode of The BOOT Camp podcast, I talk about why we should do it anyway. #004 "A chat about fitness and not going to the gym with SJC Yoga"
I want to keep Fridays podcast all about fitness, so on the first of my "Fitness Friday" podcast I interview Yoga and Fitness expert Susan Cowlishaw and we discuss some things around fitness and training. #003 "Don't be afraid to smash it up"
Sometime when we are changing something we need to completely start from scratch, other times not so much. This episode talks about it. #002 "Why complaining is a waste of time"
#001 "Time for a change"
I have recently gone through some significant changes to my online presence including this podcast channel. On the 26/11/18 I removed all the other 50 episodes and are starting anew. This Episode talks about why.